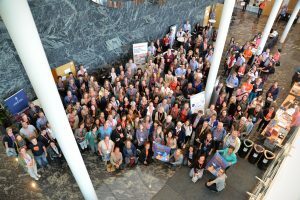 This year’s edition of the annual EUROCALL conference took place in Jyväskylä, Finland. 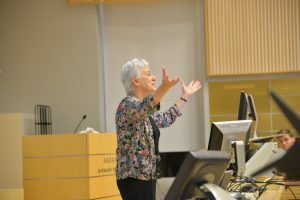 Delegates appreciated the excellent (1) organisation of this 4-day event and the great facilities at the University of Jyväskylä, beautifully located at a lake. 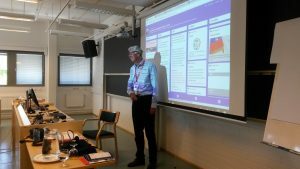 TELLConsult, represented by Ton Koenraad, offered the workshop ‘ Models, strategies and resources produced in EU projects for m-learning pedagogy development and training in Language Teacher Education. Guided by a number of hands-on tasks participants reviewed selected outputs and interim results of a number of EU projects on mobile learning TELLConsult was/is involved in. Views were exchanged on their potential to contribute both to implementing mlearning in language teacher education and to enhancing their current methodology curriculum modules on MALL in school practice. To support sharing experiences during and beyond the workshop with these and possibly other resources delegates are aware of / use relevant for initial teacher education and/or CPD we deployed a Padlet page. https://nl.padlet.com/ton_koenraad/EuroCALL18. Further contributions – also by professionals that did not attend – to this resource are most welcome. Furthermore we volunteered to support Bruce Lander who accepted the invitation from the current chair of the MALL-Sig to take over for two years. We enjoyed meeting a number of new EuroCALL members and our dear friends again and appreciate the loads of input received during the paper sessions we selected (see all abstracts here ec2018_abstracts_2008_web) as well as the posters and the keynotes including the impressive contribution by Prof. Claire Kramsch. The research presented also provides a chance to enhance a number of related (ErasmusPlus) courses of TELLConsult’s current offer. (1) Unfortunately the app with the programme + abstracts was still in Alpha as apparently not delivered as expected (specs not well communicated? not tested?). 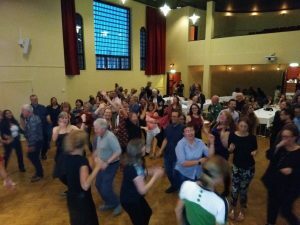 This entry was posted in TELLConsult_Projects and tagged #Eurocall2018, Conference, DEIMP, erasmusPlus, MALL, MFL, mLearning, mobile, tablet, tablio, teacher ed. Bookmark the permalink. ← Another successful ErasmusPlus project grant application initiated by TELLConsult.